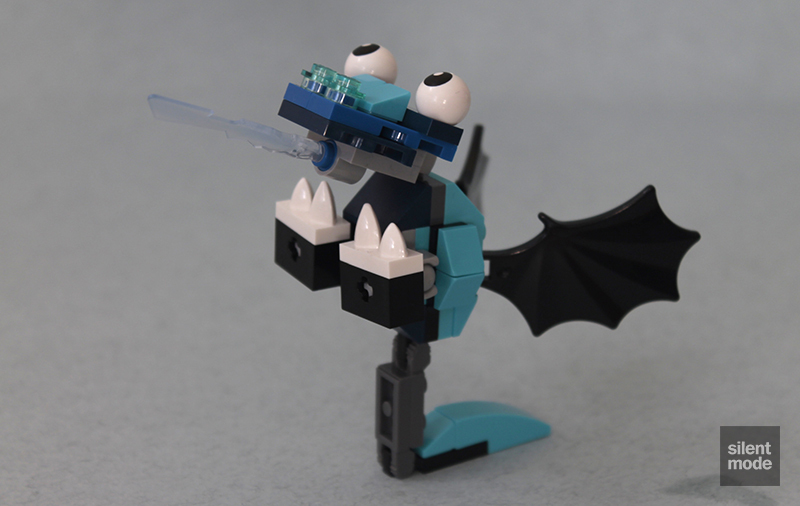 While I’m waiting on a LEGO S@H delivery, let’s continue with a review of the remaining member of the Frosticons. This one’s name is Flurr, and Flurr doesn’t look much like its cartoon representation… but as always, the finished build often looks better than what’s on the packaging. If you liked those Medium Azure cheese slopes that Lunk came with, you’ll be pleased to know there are twice as many in this set – though sadly they also replace the Trans Medium Blue cheese slopes the other Frosticons have. Also in Medium Azure are two 2×2 plates and a 1×3 curved slope, expanding the palette even further. Other interesting parts include two Black 1×2 brackets (a great part for SNOT builds), a Dark Blue 1×4 “modular” plate, two more of those new Teeth plates in White, and of course the new joint parts. For some reason there are three socket plates, one ball plate and two Technic axle/ball pins. You’re familiar with the starting point, but this time it takes on a different shape: this is the first horizontal (rather than vertical) Mixel we’ve come across. Seeing those ball and socket joint plates put to use is beautiful. Then a couple more stepped hinge plates are used to form a tail, along with the 1×3 curved slope. Teslo currently holds the title for most menacing tail, although this one looks potentially lethal. Flurr has a snake-like head, with another of those Trans Medium Blue “lightning” parts serving as what looks like an icy tongue. The last things to add, much like with City vehicles, are Flurr’s means of getting around. It has even stubbier legs than Shuff and Slumbo – you might have thought it wasn’t possible, but oh yes it is. Here it is: Flurr, the stealthy flying snake of the Frosticons. Its MO is to sneak up on unsuspecting Nixels and freeze them into submission using its icy breath. That’s the story I’m going with, until LEGO officially releases its description. You’ve probably got plenty of half-pins and Trans Light Blue 1×1 round plates (the latter being a staple of Pick-A-Brick walls), but at least there’s another cheese slope to play with. 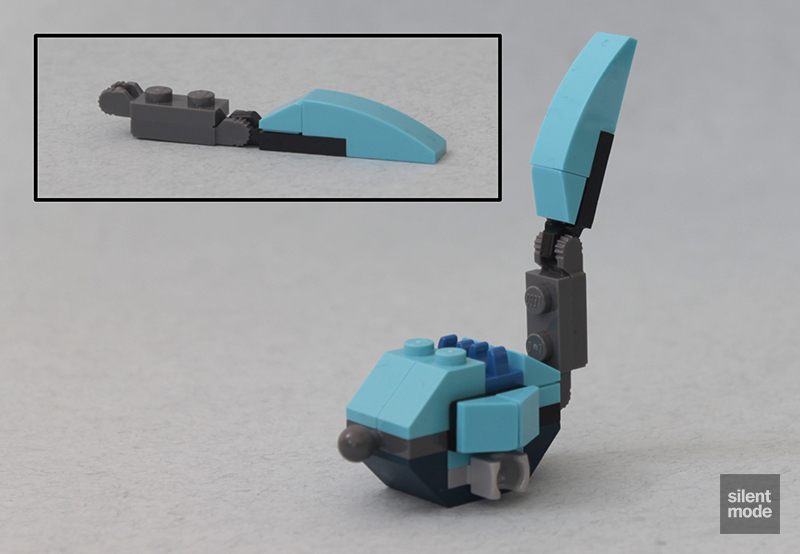 Flurr is another good candidate for a “look at me, I’m into LEGO, I’m so cool” mascot for a workplace desk, although its very short legs limit its posability without using tack or sticky tape. Again, as with Lunk, the use of stepped hinge plates for the tail restricts its flexibility, although they did help with achieving the above pose. In contrast, the head movement is made just right with the help of the ball and socket joints. At worst it’s another Mixel for the collection, with some good parts – and even more joint parts – if you’re not interested in the build. I’ll give this one 6.2/10. 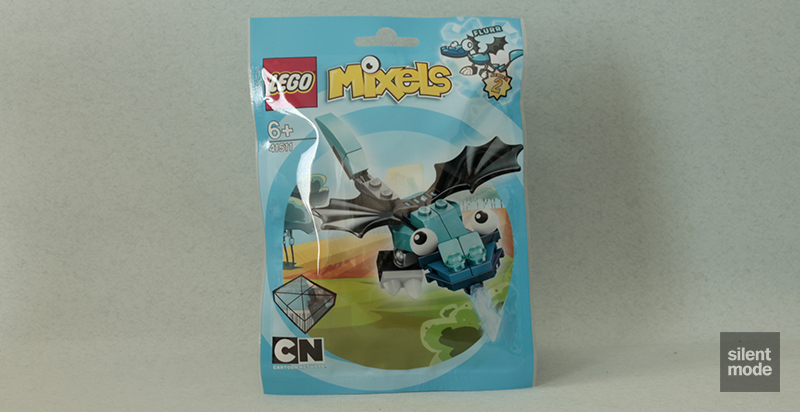 Unfortunately the instructions for Frosticons Max aren’t on the LEGO Mixels website yet, but stay tuned to SilentMode.tv as I’ll be building it as soon as they are.